Probably the best position in Cobham. 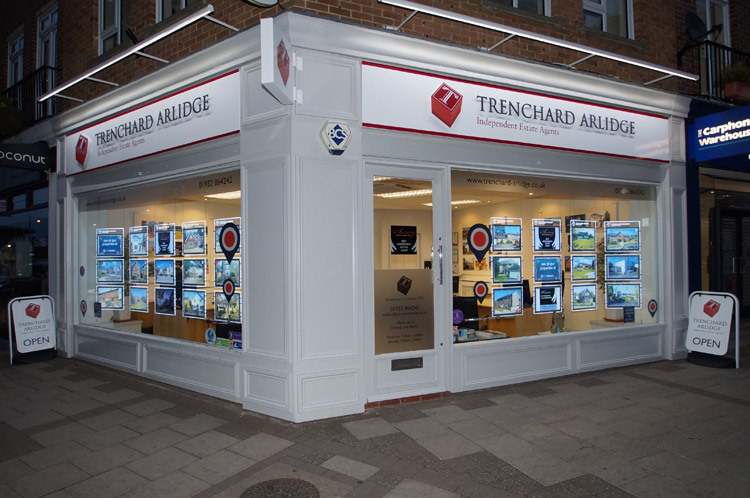 Facing onto the High Street, our office in Oakdene Parade has excellent road and pedestrian visibility and the two large windows offer a superb property advertising arena. Cobham is a small picturesque town situated within easy reach of Central London, yet surrounded by miles of the most beautiful Surrey countryside, including many areas of outstanding natural beauty. As an ancient settlement, Cobham’s origins can be traced back to the Iron Age. It was listed in the Domesday Book as Coveham or Covenham, which probably meant settlement in the curve of a river. Later it became two separate communities, Street Cobham and Church Cobham. The River Mole has played an important role in helping Cobham retain its rural appearance by limiting the spread of development, and the restored water mill on the river’s edge is a well known Cobham landmark. Today, this charming town offers a fantastic choice of everyday and specialist shops, boutiques and supermarkets and provides an excellent variety of cafés and restaurants, creating a lively, cosmopolitan atmosphere. Leisure opportunities are plentiful, with excellent golf courses and fitness centres, in addition to numerous areas for walking, cycling, horse riding and other outdoor activities. Cobham is particularly well-placed for easy access to Heathrow and Gatwick airports and the motorway network via the M25 (London Orbital) at Junction 10, which is approximately three miles away, and 19 miles to Central London via the A3. Cobham and Stoke D’Abernon station offers a direct service to Guildford and London Waterloo. There are a number of outstanding schools in the vicinity including Parkside, Notre Dame, St Matthews, Cobham Free School, Claremont Fan Court, Reeds, Feltonfleet , St Andrews and the ACS Cobham International School.